If you take the train from Barcelona to Girona, one of the towns you'll pass through is Sils which looks from the train window to be an unprepossessing place of new houses and villa estates of the type that are scattered just south of Girona at the far end of Barcelona's Rodalies train network. 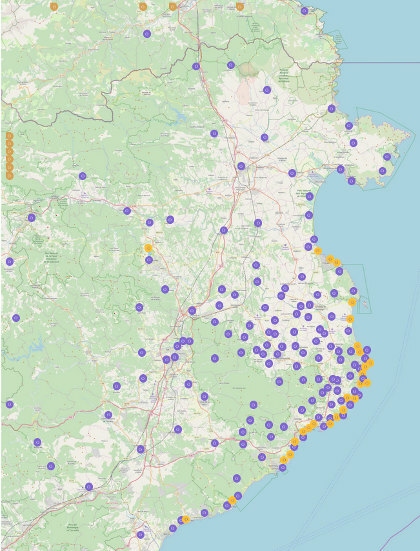 There are isolated housing estates dotted all the way up from Maçanet, across to Lloret and up to Vidreres and Caldes de Malavella, some visible from the train or motorway and others much more hidden away. We discovered by chance that Sils has a lake (Estany) driving through on an explore so took the chance to call in. This was the end of January so we're a little behind on adding to the blog this year for a variety of reasons. The lake as it is described on the maps is more accurately described as an area of wetlands with much of the water filled with reeds and, in a number of places around the lake hides for bird watchers. Access is easy - with parking at the railway station. The older parts of the town are relatively small with a church and a collection of older buildings, before spreading out into newer areas beyond. The lake is well signposted with an easy broad path around it, though the reeds keep open water, and so birds, a little into the distance. Like many flat wet, or previously wet areas, the lake is lined by regimented rows of trees in plantations. In spring when the leaves come this would be very pretty, but in winter colours the trees were bare and the plant life in winter dormancy. The path around the lake seemed popular with people in the area. In all, if you are nearby its a good place to walk, but probably not one that you'd travel miles to do. 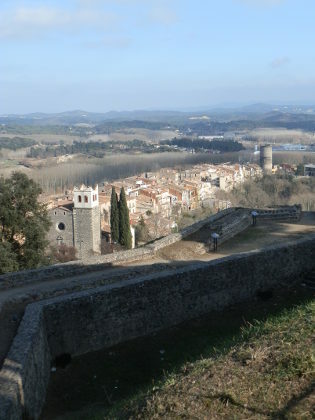 Hostalric is a walled town with a large castle on the river Todera at the start of the Valles Occidental beneath Montseny heading towards Barcelona from Girona. Its location made it an important strategic post and the town retains its fortified walls and large castle. Despite its impressive history, the town is small and easy to bypass rushing through from Barcelona to Girona on the AP7 or on the train, so even for Catalans its an easy place to miss. We've visited a few times, firstly from Barcelona as it's on the main train line and easily accessible. For visitors to Blanes, Lloret or Tossa de Mar, Hostalric is relatively close for the chance to get away from a beach to somewhere a little different. 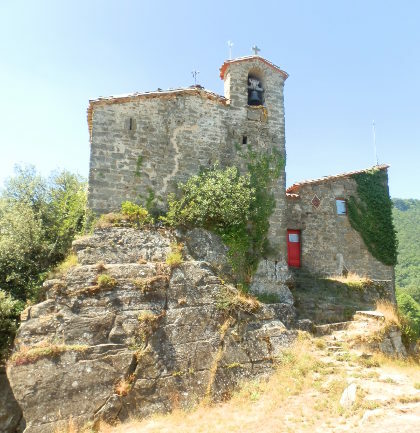 It would also be easy to combine with a visit to Montsoriu castle which sits high on an isolted hill with fabulous views all around, and to Montseny itself. Our aim was more a day out than a walk so we found a stroll rather than a long country walk, though there is plenty of walking and hiking nearby. The town has a main square with parking, but this was full so we parked down the hill closer to the station. This meant we had a good view of the impressive grey granite walls of the town from the outside. The walls are well preserved and in places have been converted into modern accomodation. There are a handful of gates into the town, but we headed to the main square area were a couple of cafes look out over the river plain below. We wanted to get down to the plain so we followed the Carrer Ravel down the hill past an isoltated, tall defensive tower. The tower has steps and presumably it would be possible to go up to the top, but when we were visiting it was closed. We walked all the way down the street before we realised that there was no access to the river from the lower end. It was only as we were walking back up that we found the path and we walked down and across to the river. There was water flowing and the size of the river bed suggested that in spate it could get quite wide, but at the moment in January it was quiet and lititle more than a big stream. The path follows the river under a few tree plantations before turning back across the fields. Above us we could see the castle - a proper fortress - dominating the view. Our path reached a road and we followed the signs up to the castle walls. 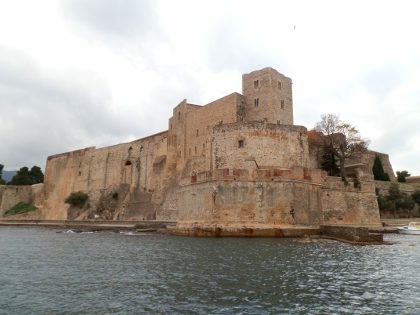 The castle itself is a ciutadella type castle with big earthern walls at jagged angles in the style of the 17th century fortresses, designed to resist cannon fire. The building of the walls is in brick with view points above the moats and spaces created by the angles. A signboard explained how the fortress was captured in the War of Spanish Succession in 1713 as the Bourbon Spanish king conquered Catalonia. 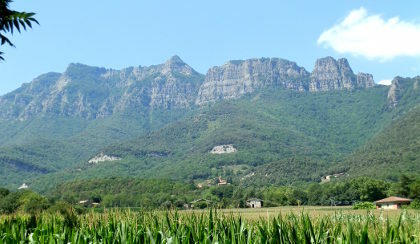 The castle has good views over the plain and Hostalric below, and through to the hills and Montsegur on the other side. Walking around the walls is free, but there is a restaurant at the heart of the castle with a bar and terrace if you want to enjoy the view. The path down from the castle crosses the old walls and down into a corner of the old town. Hostalric's old town sort of only has two streets running in parallel down from the castle with cut-throughs from time to time. 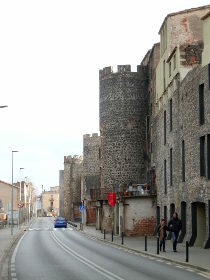 We took Carrer Major with it's houses tucked behind the town wall. It's quaint but still very much as working type town. And we emerged at the bottom by the placa to sit in the sun and watch the world go by. Collioure is a very pretty picturesque French town on the Mediterranean coast just the other side of the Spanish border (Cotlliure in Catalan). We visited in early December (2015), but as we've been busy prior to Christmas and having Christmas in England, this is the first chance to write it up. Zina, our dog, is now fully recovered so we can venture out more easily once more, though a very active sporting agenda for our teenagers means getting out and finding new places to explore at the weekend is getting more challenging from the point of view of time so posts to this blog are likely to be more sporadic. 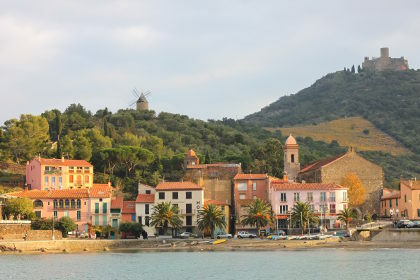 Collioure is accessible from Spain either from the very windy coast road up from Llanca, or more easily over the main autoroute crossing between France and Spain at Le Perthus, then driving along the plain beneath the Albera hills towards Argeles-sur-Mer. Collioure is then the first time into the hills south of Argeles. It would also be possible to reach by train and foot from Port Vendres - the next town along. The journey into France is normally very easy, but because of the terrorist attacks in Paris, the border to Spain now has checkpoints as in the days before Schengen. For us, this meant a queue of traffic about 4km long from Spain to France which added about an hour to our journey. And over Christmas, we saw reports of queues of 21km to cross into France on some of the busiest days of the year. Collioure itself is tucked under the hills so you can't really see the town from the main Argeles to Banyuls-sur-Mer road and you don't really see the centre until you actually reach the centre of the town. 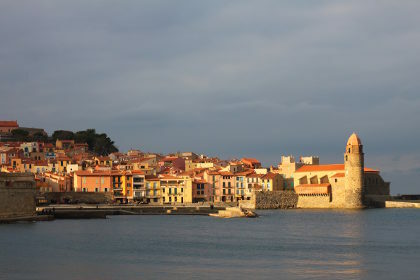 Since, as per usual, we hadn't looked up another about the town it was therefore a very pleasant surprise to see how charming the old port and castle (Le Chateau Royal de Collioure) were, backed by the old Fort Saint-Elme in the background up on the hill. The town itself is not large with a few small back streets and an easy stroll along the sea front. The chateau is large and you can pay to visit (we didn't). It was founded by the Knights Templar and formed a strategically important defense of the old Catalonia before the separation of Catalonia into the northern part now in France in 1659. 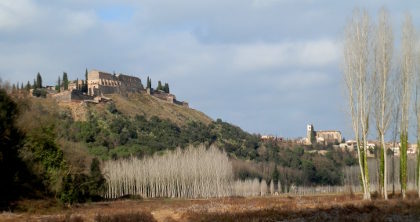 After the French took the town, it became and important part of the French defences and is another of the Vauban strongholds that lie along the French side of the Spanish border (eg Bellegard above Le Perthus and Mont-Louis in the mountains, or Palace of the King of Majorca in Perpignan). 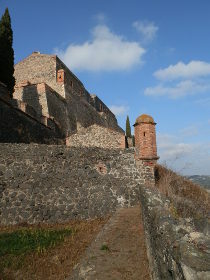 More recently, during the mass exodus of refugees fleeing the Spanish Civil War (the Retirada), Collioure and Argeles were used to house refugees, with Collioure Chateau being used practically as a prison to hold refugees considered dangerous. The town has connections with impressionist artists, like Matisse and Signac and maintains many galleries in among the back streets. For someone interested in art, a tour combining Figueres, Port Lligat, Ceret and Collioure would encompass many famous early 20th Century painters. Hectic weekends going hither and dither with children means we've slowed our rate of new walks considerably, returning to old favourites close to home. And so we are in November with temperatures up and over 20C during the day and headed to Platja de Fonollera (Pals Beach) with Zina, our dog heading to Gola de Ter. Out of season, this is a lovely open beach scattered with driftwood and mounds of white sea-washed sticks and tree-trunks. The Gola de Ter where the river meets the sea forms a vast lake with views across the reeds to Montgri, and open water across the sea to the Isles Medes in the sun. The fresh water is great for Zina to swim and chase sticks in the water. This weekend though it didn't turn out so well. Walking along the beach Zina found something to eat washed up high above the waterline. We didn't pay too much attention as she often finds something washed up and is either sniffing and occasionally finds a fish washed up. It wasn't until after she came out of the water at the Ter that we noticed a line of fine thread dangling from her jaw, glinting in the sunlight. At first it looked like a long hair possibly that had been floating on the water. No. Unfortunately whatever it was that she'd eaten further up the beach had been attached to a line and an hook. We pulled once to see if the line would dislodge, something we probably shouldn't have done, but it was stuck fast and she coughed up a little blood. So straight to the vets (there's an animal hospital next to the bus station in Palafrugell). 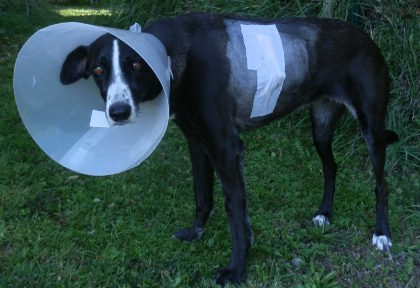 Overnight the vet operated to remove the hook which was caught in her oesophagus, leaving us with a vet's bill of about €800 and a confused and uncomprehending dog with a big shaved patch, a scar on her side and a catheter on her leg who needed several x-rays and several days of observation. We can't say whether the line and hook had been discarded by a careless fisherman, or had washed up from a boat offshore, but a big lesson to be careful with dogs on the beach. 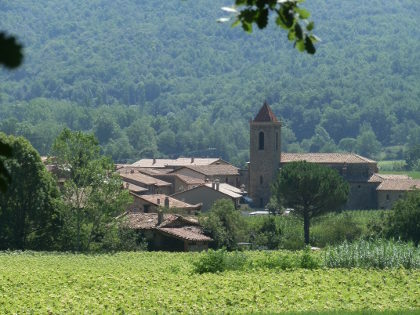 Just to the north of Besalu and Castellfollit de la Roca (both worth visiting in themselves) are the the largely unpopulated hills and mountains of Alta Garrotxa that run to the French border. In amongst the hills is the small hamlet of Sadernes and a popular Catalan walking route through gorges up to a small refuge/chapel at Saint Aniol d'Aguja, along a small river that in summer forms a series of deep pools of crystal clear water that attracts families and locals for swimming. Along the way we walked past steep overhangs and sheer cliffs that were being tackled by intrepid climbers. The path and walk is well-known among those who live near Girona and there were lots of families on the path, but it's well off the tourist trail. We saw it on the Costa Brava & Girona Hiking / Biking Meetup Group run by local English resident Nigel Perrin, who organises group hikes and walks in this area. The walk itself is relatively long. Though the river runs through Sadernes, from what we could see the best parts of the river pools start about forty-five minutes up the gorge, so there is a a good walk to be had before 'the start' along a somewhat dry track. 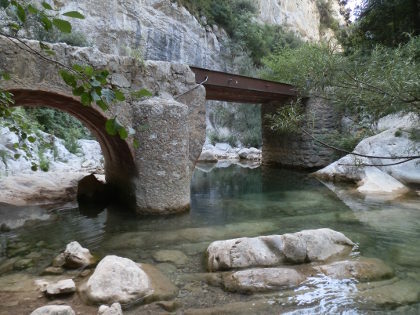 Once the pools proper start, the path becomes a narrow track along the river that continues for about 60-70 minutes until you reach St Aniol with opportunities for swimming or dipping all the way up. Despite the relative length of the walk, we saw lots of families with young children, and some groups laden with picnic boxes walking up for swimming. In fact the swimming is fabulous, so do take swimming trunks, but water shoes (or trainers you don't mind getting wet) help under foot. For our walk, we parked at Sadernes itself. The small car park by the church and hotel/hostel was full when we arrived and we went back to park in an earlier layby, but as we started the walk we discovered there was additional parking past the chapel. The track heads out along the valley and though the signs said no vehicles it is used occasionally by locals for the two or three houses along the valley. The track itself runs along the edge of a gorge to one side, but mostly we couldn't see the bottom, and where we could the river bed seemed to be dried out, so we weren't sure whether we'd see water. The path continues up, crossing the river at one point just below an high rocky overhang being used for climbing. As we were getting to the bridge we could hear shouts and splashes, possibly of a group canyoning through the streams, but again we could not see. From the bridge, the track continues but with high cingles (escarpment cliffs) above us on the far side of the river. The scenery feels a little harsh with the bare rocks, trees and dry path with a sense of remoteness were it not for all the people walking as we passed a group every five minutes or so. The path makes its way up steadily but after about 40 minutes or so we weren't sure if there was anything worth going on for and we might have turned back were it not for the other people who clearly knew something we didn't. The change came as the track turned across the river with stepping stones needed to cross the water and became a small single track path. Ahead of us we passed a group of Argentinians hauling big picnic boxes up the path, wearing flipflops of all things, though this was a proper walking path. The path then continued along the side of the river up and down, meeting the water at points and climbing up over the sides high above the water in others. The river has a very rocky bed with large rocks smoothed by the water that have created large deep pools that are separated by small streams and waterfalls. The pools are full of cystal clear water, a little cool, but with the rocky ledges around, perfect for jumping into the pools and swimming around. As we walked up the path, families would drop off to take a place by one of the pools setting out for an afternoon enjoying the water and the scenery. We continued up taking the path all the way to St Aniol where a small chapel and an old refuge house in the process of being renovated stand in a small dell reached by crossing a small suspension bridge. The place was busy with hikers and families sat around eating picnics with large numbers of rucksacks outside the building. Above the refuge are two further paths. One goes up to a waterfall Salt de Brull (Salt is jump or used for waterfall in Catalan) with a deep blue pool of water where teenagers were jumping into the water. 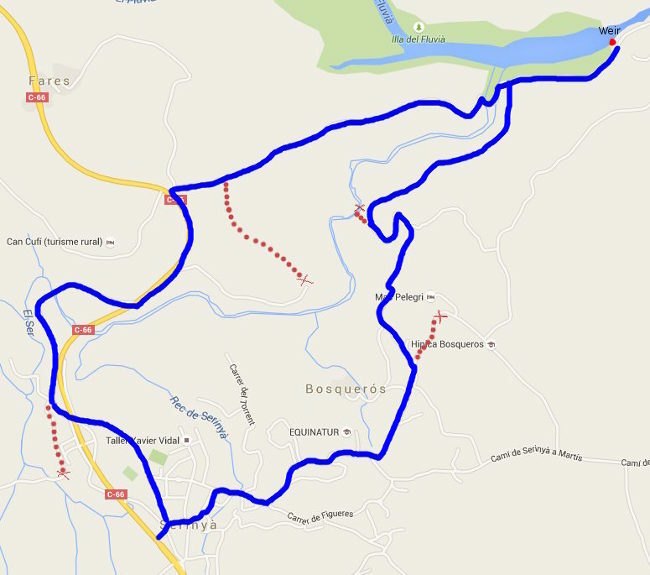 The second makes a loop back towards Sadernes via the Salt de Nuvia. We did try this path, but the path goes up and crosses across the top of some cliffs which triggered a dose of vertigo, so we eventually came back down the way we came. Returning this summer a little earlier in the season (July) there's more water, but it's a little chillier - though fine for a hot day. This time we were a little more prepared and though we didn't go all the way to the top, we had a great time coming down the river for part of the way back through the rock pools and waterfalls with water shoes in and out of the deep pools and over rocks. Gola del Ter is where the river Ter meets the sea mid-way along Pals beach between Platja de Pals at one end and L'Estartit at the other. For our swimming series this is a little unusual because it's not so much about the beach, or the swimming and more about the wonderful novelty of swimming between fresh water and salt water environments. The river reaches the beach and forms a large lake of fresh water behind the beach. In the summer, Rosa del Vents a specialist in children's camps for Spain has a windsurfing and canoe hire centre for the lake. 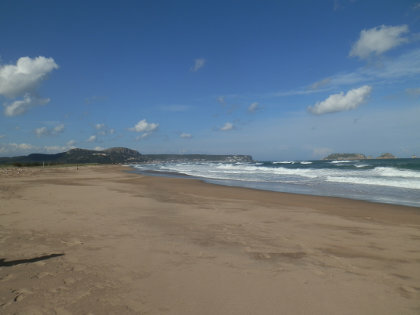 On the other side of the beach, the sea brings waves into the shore on a sand bar while the river cuts the beach in two, the north to L'Estartit and the south towards Pals. In winter this means you can't take the beach path all the way up, but have to find the first crossing of the Ter in Toreolla de Montgri (6-7km). But in summer, if you don't mind the swim you can swim across the Gola, or just play between the fresh and salt waters. Because the beach and river are quite a way from the towns, dogs are permitted on the south side (just not on the sand dunes) and part of the beach a little further north towards L'Estartit explicity allows dogs, so this is a popular area for dog-lovers, and the dogs tend to really enjoy the fresh water. We wouldn't come here for long swims or snorkelling, but the two types of water make for a fun experience. On the river side, the water is a little murky and lake-like and of uneven depth from where the channel of the river moves. Parts are very shallow (less than 50cm deep), and then other parts drop away rapidly, so take care with small children. The lakeside water tends to be quite warm - several degrees hotter than the sea. Following the river to the sea, the channel through the beach is often more for wading or paddling than for swimming before reaching a low sandbank. As the river reaches the sea, the water becomes wavy and much cooler with a scent of saltiness. Further out it's just like swimming in the sea again, albeit on a big open bay. Rosa del Vents has an area with windsurfers and canoes for use on the river/lake side. There are no other services and no apparent lifeguards - the beach is a bit remote, though popular, so don't expect anything nearby. The sand is soft both into the river mouth and along the beach. If the wind is blowing it can feel quite windswept. For real keen swimmers it's not the best location, but the novelty of the two types of water is worth discovering. Take care over water depth though if you have children. All the children from Rosa del Vents wear life vests when doing their water activities. There are gravel tracks out to sandy areas used for parking from both Torroella and to the south. We usually park by the Balena Verd campsite to the south. You should expect to need to walk as this is a remote location. Serinya is a small village situated between Banyoles and Besalu and we're walking here for no other reason than to explore the area a little. As with exploratory walks, we're probably not taking the best route or seeing everything the area has to offer, and in fact we did go the wrong way several times, ending up on tracks that were blocked or that lead to houses or farms. However, we were particularly impressed with the almost secret lake made from the weiring of the river Fluvia at the Illa de Fluvia. We start just outside the centre of the village looking at the church, which from the outside looks strangely lacking in windows. The old village centre is quite small and behind the church is a small courtyard that leads out to a lane over a small brook. As we're off the coast and August has been quite stormy this year, the brook has water. Following our nose we head out towards the neighbourhood of Bosqueros along a small quiet road that passes a different farm house every two hundred metres or so. Unlike the tight clusters of houses towards the coast, this is farming country and the houses are more spread out with big gardens and yards. 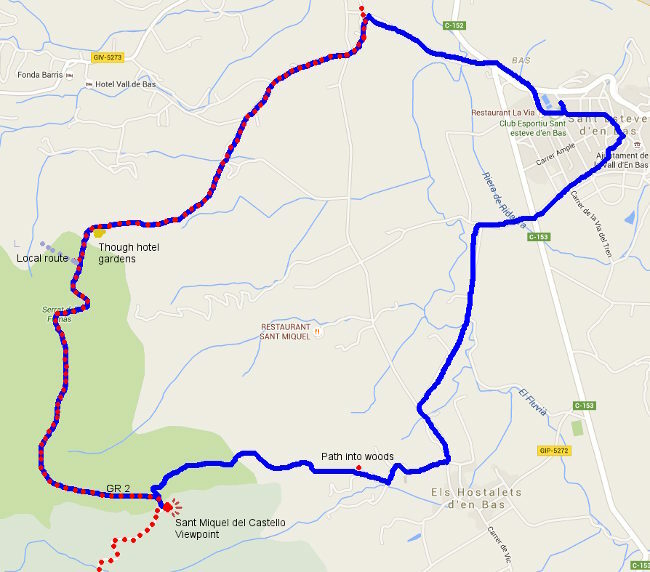 Our route is taking us towards a couple of horse riding centres, firstly past Equinatur and as the road bears to the right directed towards Hipica Bosqueros, we take a gravel track straight on and in towards the woods. On the map we think we're trying to get to a path at the back of the riding centre, but the route runs to a large gate and private road at Mas Pelegri, so we take a previously passed track down towards the woods, passing a small group of riders on the way up. The track curls down the hill, past a couple of fields towards the river at the bottom where we can see evidence of the horses. The path on the map is marked as going along the river, but we can't see the path, so we have to go back up a little in order to take a smaller track into the woods which does go the way we want snaking through the overgrown scrub of the woods above the river. We emerge at a much larger road with a large expanse of water in front of us. 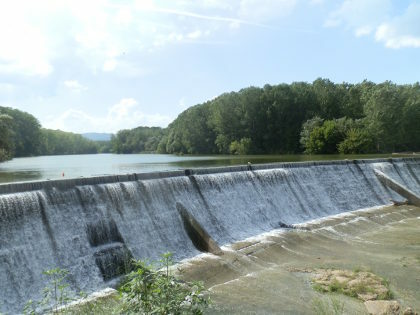 This is the Illa del Fluvia a broad lake formed by a weir on the river with soft greenish water that looks like it would be better for fishing than for swimming. We can hear the weir, so we walk along to find a large embankment and old electricity station seemingly in the middle of nowhere. The trees around are tall and cool the air and with all the greener around we could be in the middle of France. Returning from the weir we cross a bridge across the river, a small terrapin perched on a stick in the river dives into the water to hide. The track climbs gently back towards fields at the top, and we can see from the map that we have a busy road ahead of us. A marked path seems available to avoid at least some of the road, so we follow it down the hill, only to find ourselves practically in the garden of a house, with a big imposing gate barring our way. So back to the top, the August heat now starting to get to us and a stretch of unpleasant fast road to contend with. Crossing the road we find a quiter route along the old road, connecting with one of the GR routes. This takes us back towards Serinya - at least it would if I hadn't mis-read the junction, so we have another double back before finding the proper route under the road, then through the small woods and back. For our explore, the Illa del Fluvia was delightful, but next time we'd want to find a better way to make the round trip that doesn't involve so much road. 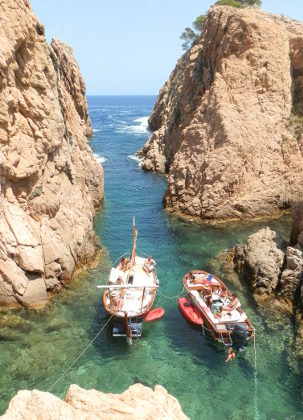 August is upon us and every car park on the Costa Brava is full, boats are moored in every cove and the whole place is buzzing in French, Dutch, German and English. So we headed out for a day to the Vall d'En Bas just south of Olot - a beautiful flat valley, verdent in the summer sunshine, beneath the hills and escarpments of the Garrotxa and Puigsacalm/Collsacabra. Starting out as mainly a visit, as we passed this way as we headed to Rupit, we found a walk up to the Emitage of Sant Miquel de Castello perched on a promontory high above the valley with great views along the valley to Olot and out to the Pyrenees. 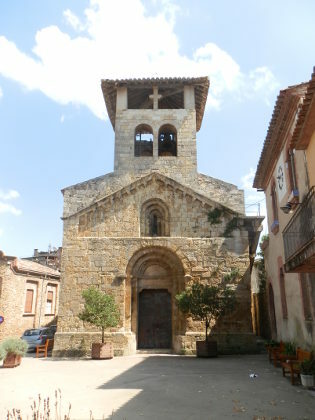 The starting point was in the village of Sant Esteve d'En Bas a small village with some character and hidden streets of vaulted archways, but otherwise not particularly distinguished. We park by the swimming pool, having discovered that the main road runs past the village quickly without obvious signs of parking by the church. We the head up the small hill to the older streets above the more modern parts of the village on the flatter plain below. The village looks out across the Bas Valley towards the escarpments on the other side of the valley, and on top of a small peak we can see the signs of a small chapel. Taking a guess we leave the older streets and find a footpath marked by the scallop symbol for the local part of the route of Saint James (Sant Jaume), part of an old pilgrims route to Santiago de Compostella. This takes us into the flat of valley through the fields high with corn towards Hostalets. Just before we get to Hostalets, we see the sign for the path to Sant Miquel. Guessing that this is the chapel above us we take the road up towards a few small farms. At the back of the last one we spot another sign which leads into a narrow track running around the back of the farmhouse climbing into the woods. Being August, the temperatures are still relatively high, so it's good to get into the moist shade of the woodland. The path climbs steadily - at parts steeply through stream beds, but the route is very clearly marked. It's a very steady 40-50 minute energy sapping climb through the woods leaving us sweating and breathing hard at times (do take water!). The trees around make it difficult to judge how far up we are, or how much further there is and the path zigs and zags as we climb. Eventually we hear voices above us and our steep path emerges at a flatter path at the top where a couple of families are heading down. The path passes through a cutting in the rocks before curling around to the promontery and the refuge of Sant Miquel del Castello. 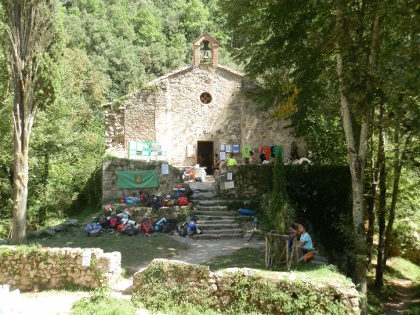 The refuge is run but GEiEG - Girona's long established excursion and sports club and in theory it should be possible to stay a night in the refuge, but it was shut when we were there, so probably requires prior arrangement to use it as a stay-point on a walk. Sant Miquel is high above the valley floor with views almost all around. To the right we can look to the farms and meadows above the escarpments which almost Swiss-like with cows grazing, while to the left we can see the peaks of the Pyrenees devoid of snow now in summer, but presumably bright white in spring. Beneath us we have the valley floor a few hundred metres below us. The whole area is fenced off, but the drops are quite steep down. After a little lunch and recovery, we return to the the path, following the route taken by the families down a steady downward path along the edge of the beech woods, leaves crunching underfoot. This is the GR2 - so another of the Grand Radonee major national footpaths and is marked by red-white flashes on the rocks and trees. Downhill is easier than up, though there are a few steeper places. Midway along we pass through a sheep/goat field where the trees have been removed and the hillside opened to pasture - another Swiss-like feature. One of the amazing and enjoyable things with Catalonia is just how many different landscapes are in such a small area. The path continues down and we pass other hikers coming up. As we get closer to the valley floor again, our path splits from the local path (to Joanetes) and we keep following the red-white flashes emerging, to our surprise, through the gardens of a hotel newly created from a restored masia farmhouse. We feel a little uncomfortable following our path (still the GR2) past their swimming pool with guest lounging at the side. At the end of the hotel gardens, the route is a little unclear. I was going to head down the road, but instead we find the path a little over grown running along the side of the hill. Again for a national route the overgrown and unkept nature here is a little strange and we keep having to check we're on the right route. Eventually we emerge at the fields at the bottom and it's an easy stroll across the flat of the plain before turning back up to Sant Esteve. Platja Fonda in Begur is an almost hidden beach around the corner from Fornells on the Costa Brava on the same stretch of coast as Aiguablava. The contrast with Aiguablava almost could not be greater. 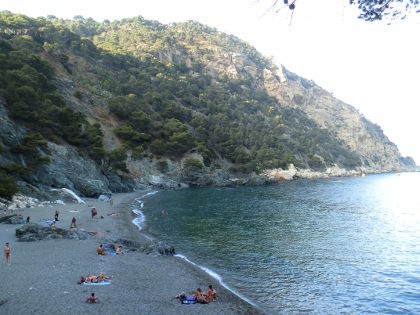 Whereas Aiguablava is a fine sandy beach that opens into coves and the sea, Platja Fonda is a dark brooding beach sitting under the cliffs that rise up to the top of Cap Begur with dark grey pebble-grit stone and high steep vertical hillsides behind. We tend to swim in the evening, and as the beach faces east, the beach was in shade by the time we arrived, but the sun was still catching on the waves and few yachts out in the bay. We may also have been lucky, but the water was almost millpond still, and with superb water clarity the swimming was like being in a giant fish-aquarium. The bay itself is relatively deep with a rocky bay below and as we swam we almost got a stationary column of fish hanging like a mobile in the water. 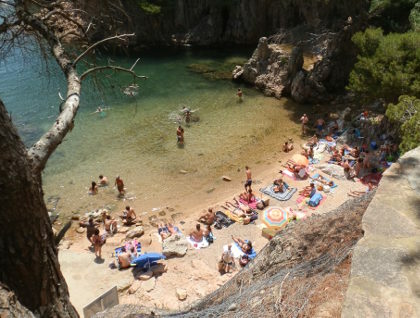 The beach itself only has one entrance and exit via a relatively steep set of stairs from a small lane from a smallish car park above through the small estate of established hillside houses (the turning is marked on the main road, or a connection to the road to Fornells). A walking path also runs along the coast to connect to Fornells village and hotels. The path gets into the beach on the right hand side with the main cliffs at the other side of the relatively long beach. The signposts warn of potential falling rocks as you come into the beach. To the right looking out to sea is a house on a rock promontory and a handful of teenage boys were climbing to get to points on walls and rocks to jump into the sea. As mentioned, the sand is mostly small dark grey pebbles with some larger rocks in the beach and occasional patches of finer grey grit-like sand. The pebbles are relatively smooth so it's not too bad underfoot, but not good for sand castles. Entering the water, the bay shelves steeply into the very clear water. The bottom of the bay falls away quickly leaving a deep column of water with the rocks below in the depths. For swimmers there is no need to look out for obstacles and the swimming is clear and easy. There are no facilities at the beach. It is left natural and there are no lifeguards. The closest facilities are in Fornells along the path. The sand is unusual in that it's small rounded pebbles and grey grit (almost like the type of stones you might use for a garden path). Some patches are sandier than others, but in general the rounded pebbles predominate and run into the water. We might have been lucky, but the water was super-still and being relatively deep and clear it was like swimming in a fish tank. The bay has enough distance for laps and we guess that it would be possible to swim around to Fornells and Aiguablava for longer distance swimmers. Walking would involve connecting with Fornells and then routes to Aiguablava Fornells and Aiguablava walk (GR92). To get to Begur would involve going back up the hill to find the steep path up the hills. After a very hot June, summer is fully with us for July and we're returning to the beaches for swimming and canoeing. Having revisited Aigua Xelida near Tamariu for a walk, we returned by canoe from Tamariu, and then a third and forth time for swimming because of it's lovely hidden coves and ravines which make for excellent adventure-style swimming. Aigua Xelida itself is just around from Tamariu, a diversion off the Tamariu to Begur road that runs past Aiguablava and Fornells. As a beach it is tiny - space for less than forty people with a mix of grit and rocks and a small stream cutting through half the beach. Normally the water is a beautiful crystal clear emerald colour with a bay that is framed by cliffs and rocky outcrops. The beach actually sits on the righthand side of the bay (looking to sea), but the bay continues around two fishermen's houses to a second even smaller gritty beach surrounded by rocks and a headland/island. What we hadn't realised until we explored by canoe, was the number of coves and hidden passageways in between the rocks and islands. In particular there is a long narrow sea-ravine just behind the second gritty beach, a hidden cove, and out of the cove and into deeper sea, too the left is another hidden bay under the cliffs inaccessible except from the water, but with lucent clear water. For swimmers who like to explore there are lots of rocks, fish, clear water pools and even opportunities for jumping from rocks into some of the deeper pools like in the ravine. The one piece of advice would be to wear water-shoes when swimming both to help clambering in and out of the rocks, but also because the bay is a little stony in places and there are occasional sea urchins in the water. Goggles to keep an eye on the water depth are also recommended. We also discovered that there is now a long-distance (1.2km) Vies Braves swimming route around the headland to the right ending at Tamariu. This is the first time we've seen these routes, but there are now ten long-distance swimming routes up and down the Costa Brava. There are no facilities at the beach. It is left natural and there are no lifeguards. Neither are there shops or other facilities nearby. Because it's tiny in summer there is barely enough space for all the towels. The sand is rough with occasional small stones and runs into rocky outcrops under a small barraca (fisherman's hut) at the back of the beach. Although not too bad underfoot by the water, getting into the water there are pebbles and stones under foot. Water-shoes makes the swimming much much easier. A second, even smaller beach, is accessible by the path behind the fisherman's houses with grittier sand and a shallow but rocky bay. Into the bay from the main beach the shelf is gradual to start but then runs deeper. Once in the water you're almost immediately swimming in a bay lined with rocks and underwater ravines in among little islands and rocky outcrops. There are plenty of fish and items of interest under water. The rocky outcrops and islands mean that you should keep an eye out for water depth as many rockier areas get close to the surface. The water further out gets deeper and the bay fills with boats, so would be good for longer distance swimming, but the whole area is just excellent for exploratory and adventure swimming. If you swim across the bay, you'll need to navigate through the gaps between the rocks, or clamber over the low islands but there is a lot to explore. Our favourite feature was the ravine behind the second grittier beach on the left hand side. The whole headland has small sea canyons - the main ravine is accessible from the beach side of the bay and cuts through the headland/island. It has steep walls but deep pools and we've seen people jumping from high into the water. The ravine is very sheltered and occasionally boats and canoes visit. At the far end it opens into the open sea, but from the sea side there are further hidden coves under the rocks. The ravine has a channel off to the right (looking out to sea) and this gives a small channel that accesses back into the bay after a scramble over rocks. Next to the ravine to the left is another small bay which also opens out to the sea. The gap is narrow and if the sea has a swell it might be difficult to get in and out. Since the ravines and coves are often hidden from view or inaccessible from the land, we'd recommend swimming in pairs or with a boat nearby. It would be easy for an inexperienced or younger swimmer to get into trouble unseen and then find swells and rocks baring access to safer waters. Canoeing is excellent, but there is nowhere to launch the canoe from, so it would involve paddling around either from Aiguablava or from Tamariu. We went from Tamariu with a south wind, which meant a swell on the sea, but very calm conditions protected by the bay in Aigua Xelida. The estate above Aigua Xelida has parking. If the car park is full, so is the beach. We covered Aigua Xelida recently on our walks Tamariu - Aigua Xelida. 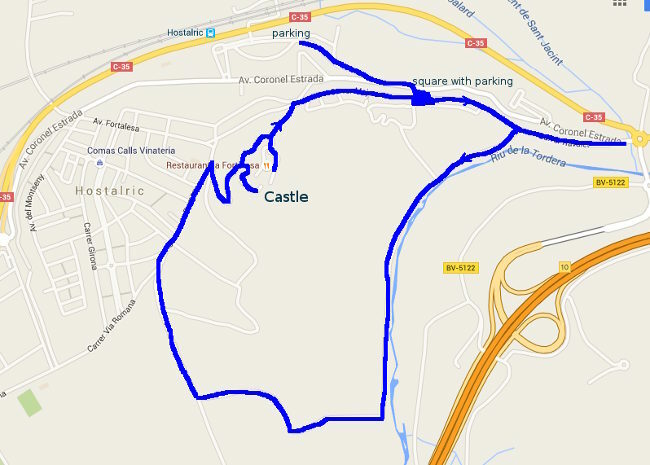 A route is available that connects with Tamariu town (lots of steps though), or it's up-hill on the road and over to Aiguablava. The days are getting hot and summer has just about reached the Costa Brava. 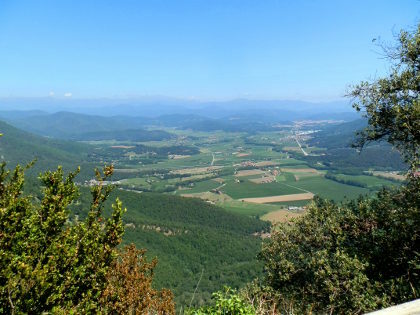 For us, that makes it a good time to travel north out of some of the heat and so we took the chance for an overnight camp in Quillan, a small town just south of Carcassonne on the river Aude and close to spectacular gorges as the river comes out of the Pyrenees. I wasn't originally going to write it up in this Costa Brava blog, as it doesn't seem that close, but in fact it is just over two hours drive from here - so closer than Andorra or skiing in Ribes de Freser, and we had such a great time doing white water rafting with Sud Rafting from their base near Axat that we just had to add it yet another possibility for people who live in the Costa Brava. 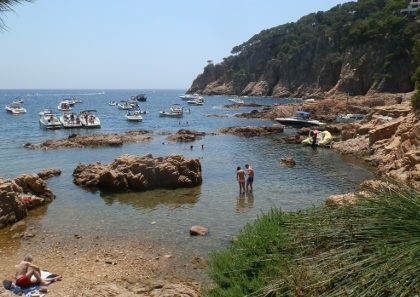 For holidaymakers who are starting to flock here for the summer season, it might seem strange that as the temperatures rise, we might look to places further north, after all summer on the Costa Brava is why most people come to visit. But we have the advantage of being able to pick and choose, and so while the beaches are filling with sunbathers it's also a time to take a few days here and there to escape the heat and hordes of the high season. Quillan is a small town in the Cathar region of France tucked into the foothills of the Pyrenees and the rivers that have carved deep gorges coming off the mountains. The Cathar region is famous for the Cathar Heresy and as the location of the Albigensian Crusade in 1208 with the remains of strong castles built on isolated peaks and hilltops that led to later legends of secrets and myths, that modern times have added to and transformed including the story of the Holy Grail and the Da Vinci code which draws on Rennes Le Chateau. 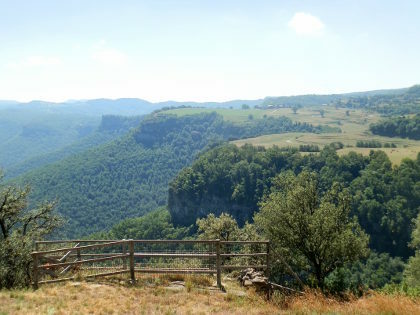 For a weekend, it's relatively easy to throw tents in the car and head into rural France without needing to book and taking advantage of the cooler weather compared to the heatwave on the coast. So we took the road to Perpignan, turned left just past the airport and headed out along the dry landscape of Roussillon towards the mountains and valleys south of Carcassonne. The countryside becomes greener and more wooded as the roads head inland reaching the river Aude at Axat, a small valley village at the head of the tourist train route (Le Rouge) that runs up the from Rivesaltes just outside Perpignan. The first day we spent touring, but we called in on the tourist office and were informed that rafting needs a reservation, so we booked for the next day and so found ourselves on one of the white water raft trips with five guys from Southampton and Julien, our guide. The experience was fantastic - eight of us on a rubber inflatable boat going down a fast moving wide river running into rapids and falls and drops and lots of white water. Of the eight on the raft/boat, all but one had never rafted before, so the first stage was to get going and get instructions. We were on the longer route, so we started about 6km above Axat - taken there by minibus all kitted out in wetsuit, life jacket and helmet - and through the early parts of the journey and lots of tumbling into the water we were shown through a series of jokes, deliberate calamities and practical demonstrations, how to get safe on the raft, how to stay on the raft (mostly, or at least when Julien wanted us to stay on) and a variety of practical ways to cope in the fast moving water. So as the boat moved through the more advanced rapids and ran into rocks or bounced off the gorge walls we'd have some idea of what to do. Over the course of the next two hours we travelled some 13km down the river paddling when Julien said paddle, stopping when he said stop and falling in the water any time he wanted to prove a point. He steered and seemed to know every rock and pool of the river. Along the way, we got thrown out of the raft a few times, jumped off rocks into the river and swam across the stream, flipped, spun, slid forwards and backwards and bounced across the waves, occasionally scraped a hand on a rock, or took in water from a sudden unplanned disembarkation. And then considered tested and ready we ended on some big category four drops and rapids for the last two kilometres of the gorge. It was just such good fun out among the elements, wet (but not cold in the wetsuit), and having a real natural roller coaster ride with moments to enjoy the wagtails tracking us down the river below the 100m high walls of the gorge, before the rush of another rapid bouncing the raft off rocks as we bobbed down the river. 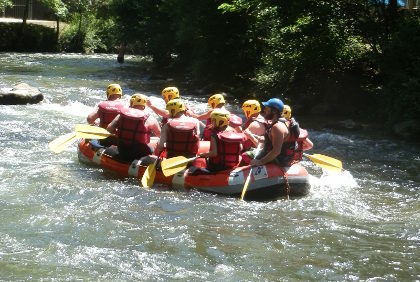 The Aude also offers other forms of white-water sports including canoing, hydrospeed. The area is also obviously also very French, which means a complete change in landscape and culture to the one we find in Catalan Emporda with the more open French-style towns and broad rivers and the raft of French produce and wine sold by the roadside. For white-water rafting on in Spain, we would need to go to Sort - towards the Val d'Aran - to have the same type of opportunity, which would be more like four hours drive from here, so sometimes we need to look laterally to find other ways to get into the mountains. 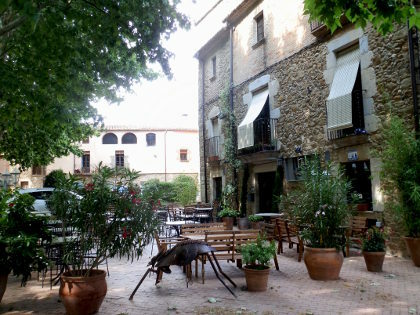 Corça is a little bit of a hidden gem situated just outside La Bisbal d'Emporda. This is the third or fourth walk from Corça for our blog, but it's still a super-charming village off the beaten track as far as tourism goes, with honey-stone houses, archways and nooks and crannies that wouldn't look out of place in the Cotswolds or the Dordogne. Yet it's so easy to miss. As is so common here, the main road, full of travellers rushing from Girona to the coast, skirts by leaving no impression of centre. So we're back to fill in a little gap heading towards Rupia with views across the plain to the neighbouring villages and out towards the Isles Medes in the distance. 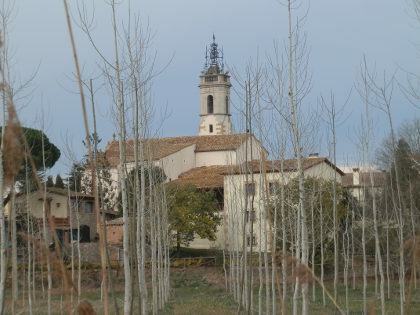 The entrance to the older part of the village is just off the main Bisbal-Girona road where from the rush of traffic on the main road, we emerge in a village placa shaded by plane trees with a children's playground just besides a small stream. There's some parking here, but we normally park just outside on the main road and walk in past the seemingly sunken cottages and school. The playground is buzzing with the noise of children and mum's but the small main bar is quiet and empty. We're mainly after the walk today so we skip the centre of the village and navigate along the lanes by the old village defensive wall crossing in and out of the old gate arches. At the top of the village we follow the sign towards the Camp de Futbol along a road of stone terrace cottages that look as if they could be twinned with Bibury. The road reaches a small chapel and we turn to the right up the road along a small track climbing gently. The noise of music and a marquee tent tell us we're just passing a colonies house. In Spain, it's extremely common for schools to arrange visits to different parts of the country for casal or colonies with children staying in special centres - usually old farmhouses - in the country with a range of outdoor activities. In summer, with the long three-month holidays, many children get a week or two at the same colonies houses either just for the fun of it, or often taking part in sports, music or learning languages. Our track continues upwards before turning right past an overgrown field with cows hiding among the bushes. 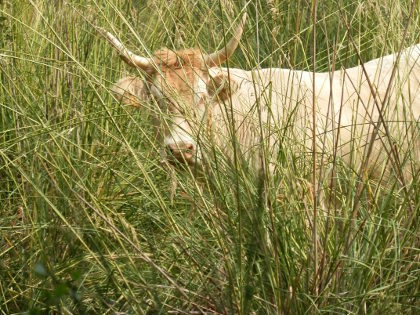 If you're used to walking in England where every route seems to go through a field with cows, you have to appreciate that cows aren't that common by the coast - you see them more in the hills towards the Pyrenees - so it's a little surprising to see them here and hidden in amongst the shrubs. The track turns to the left and we follow the signpost towards Rupia. From the hillside we can look out and see six or seven villages in the distance - small huddles of buildings nestled around the church - Ultramort, Casavells, Matajudaica closer to us and then further out to Llabia and the church of Palava standing tall. 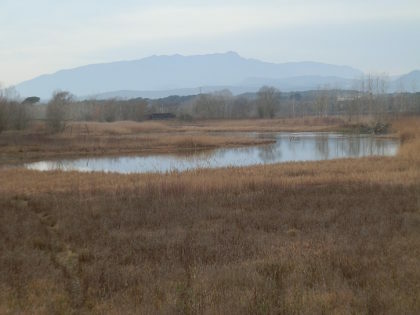 We also get to glimpse the Castell d'Emporda and in the distance we can see the estates of L'Estartit and the tops of the Islas Medes. The wheat in the fields as we walk is not so dry that's it's almost magnolia in colour despite just being the first of June. The path though continues along the hedgerows towards Rupia, but rather than go to the village itself, we shorten the route past an equestrian centre before meeting the road we took on our last walk in this area. As we get back to the village it's gone quiet. A dad and his son are racing through the empty streets, but the playground by the placa is empty as Corça goes back to being another sleepy hidden village.